The Grand Bean-to-Bubble is an elegant chocolate cocktail with a hint of orange that drinks like champagne and has a little surprise at the end… It’s made from Grand Marnier, carbonated cold-brew Marou (made from Marou’s Ben Tre cacao nibs) and topped off with Chandon Sparkling Brut from the makers of Moet et Chandon champagne. 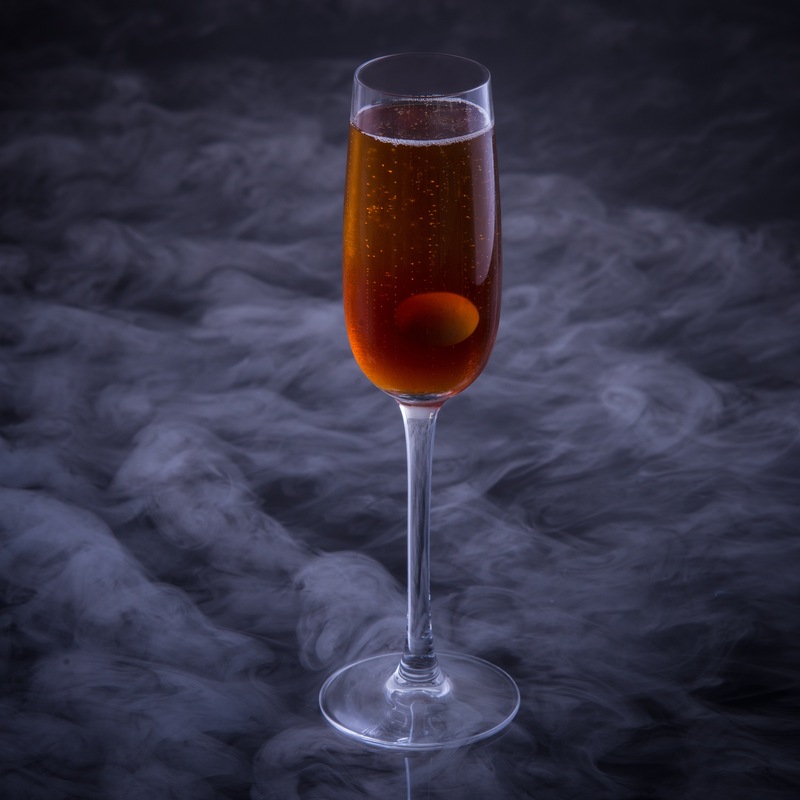 Floating mysteriously a third of the way up the glass hangs a magical sphere, which pops in the mouth went the drinker gets to the final mouthful, unleashing a hit of rich, velvety Marou Chocolate with a hint of orange from Grand Marnier. It hovers due to the different densities of the elements within the drink and adds an element of surprise as well as a little theatre. The cold-brew Marou is strong so that the chocolate notes are clear even when used in small amounts and it’s force-carbonated so that it doesn’t dilute the fizz from the Chandon. The ‘bubble’ is created using the reverse-frozen spherification technique, popular in modernist cuisine, but because it has relatively high proportions of alcohol and sugar – both elements which do not freeze solid well – I used liquid nitrogen to freeze the base liquid in a mold like this before it can be given a warm bath in a sodium alginate solution (derived from seaweed) that forms the delicate membrane that keeps the whole thing together. Many thanks to Matt Dakin for the great photo!